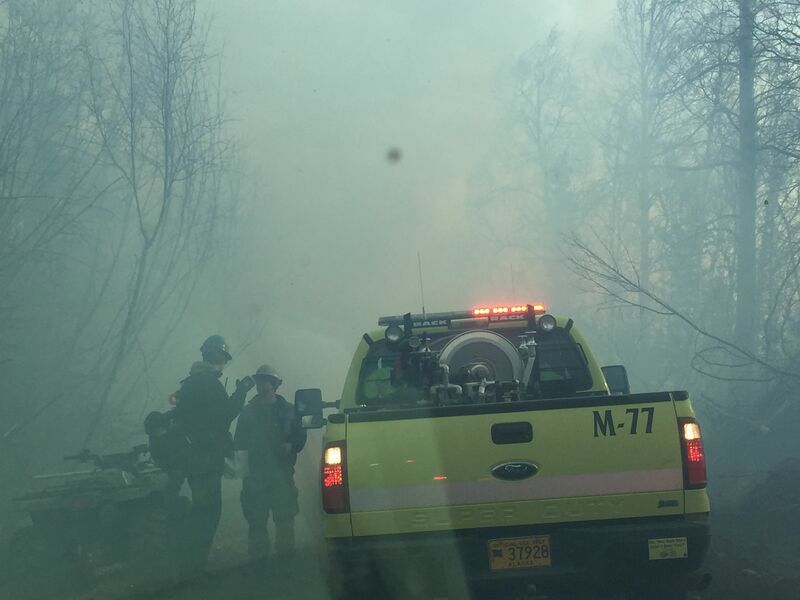 Sunday, Oct. 16 – 4:10 p.m. – A wildfire in the Matanuska Valley near Sutton is now 25 percent contained and firefighters continue to battle the blaze in harsh conditions. The Moose Creek Fire is now estimated at 300 acres, an increase of 84 acres from Saturday evening. The increase in acreage is due to better mapping. 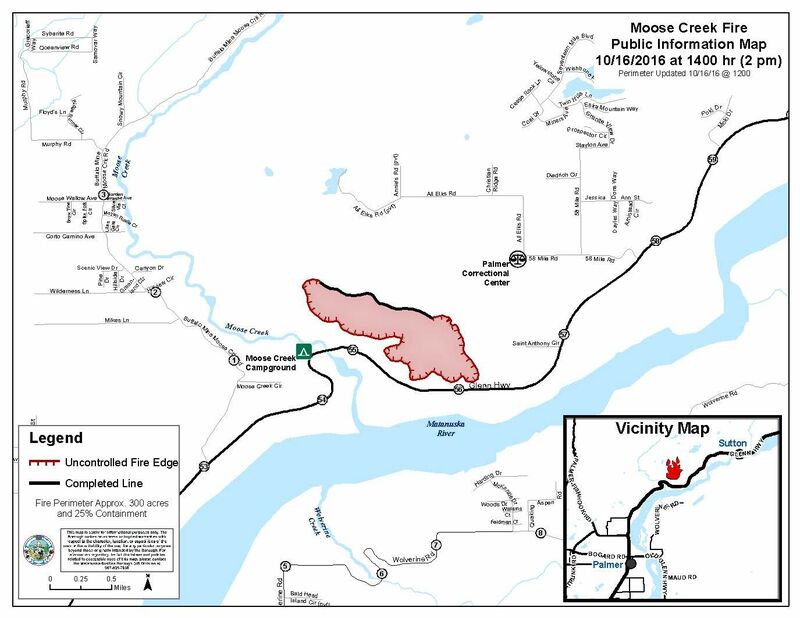 A map shows the 300-acre perimeter of the Moose Creek Fire near Sutton as of 2 p.m. Sunday. The fire is burning along the Glenn Highway near Mile 56, about 5 miles south of Sutton and 12 miles north of Palmer. The highway remains open, though motorists driving in the area should use caution and keep an eye out for firefighters and firefighting equipment on the road. Approximately 50 firefighters from multiple fire suppression agencies are continuing suppression efforts in frigid, windy conditions. Sub-freezing temperatures and high winds are posing a challenge for firefighters. Hoses, pumps and water tanks left on the fire Saturday froze overnight and firefighters are enduring frigid windchill due to the cold temperatures and high winds. Fire managers used burn out operations on Saturday to reinforce the containment line on the north flank of the fire and the majority of that edge of the fire is now contained. Firefighters focused much of their effort Sunday on containing the western perimeter, which remains the most active portion of the fire. A bulldozer was being used to build a containment line on the western perimeter and firefighters will conduct burn out operations if conditions allow to reinforce that edge of the fire and prevent from getting into the Moose Creek drainage where it could threaten homes along Buffalo Mine Road. Burning out is an efficient and commonly used firefighting tool. The strategy involves setting fire to fuel inside a control line to eliminate fuel between the edge of the fire and the control line, thereby robbing fuel the fire needs to keep spreading. Firefighters use pre-established containment lines and natural barriers like roads, trails and waterways to control the spread of a burn out operation. Burn outs use fewer firefighters, limits firefighter exposure and saves both time and money as opposed to a direct and extended attack. Two helicopters equipped with water buckets are being used to support firefighters’ efforts on the ground. Firefighters are also locating and cutting hazard trees – called snags – which pose a danger to firefighters on the ground. The trees’ root systems have been burned and weakened by the fire, making them susceptible to falling or being blown over. The Alaska Division of Forestry had limited personnel to work with on the Moose Creek Fire because much of its seasonal work force had been laid off. State forestry firefighters are typically laid off in mid-September when Alaska’s fire season winds down in the face of colder, wetter weather. As a result, the Division of Forestry reached out to multiple local fire departments, as well as several federal agencies – BLM Alaska Fire Service, National Park Service, U.S. Fish and Wildlife Service and U.S. Forest Service – to round up enough firefighting personnel to mount a sufficient response. This season, warmer, drier weather in September and October, combined with the absence of snow, has prolonged the fire season around the state, evidenced by the Moose Creek Fire near Sutton and a 350-acre fire currently burning in northwest Alaska near Noorvik. Due to the lack of snow cover and dry, windy conditions, the Alaska Division of Forestry is asking residents in Southcentral and Interior Alaska to avoid burning until conditions moderate.